Our team of nine physiotherapists form the most specialist private Physio Team in the whole of Hampshire, with all having achieved a further qualifications during their careers, cluminating in a grand total of just over 190 years of physiotherapy experience. Whether simple or complicated, we'll treat your injury or problem effectively and efficiently, ensuring you are back to peak performance in no time. spinal pain (including chronic lower back pain). We also treat more complicated conditions such as jaw pain, temporomandibular joint pain, longstanding groin pain, exercise related leg pain, frailty and postural orthostatic hypotension to name but a few. 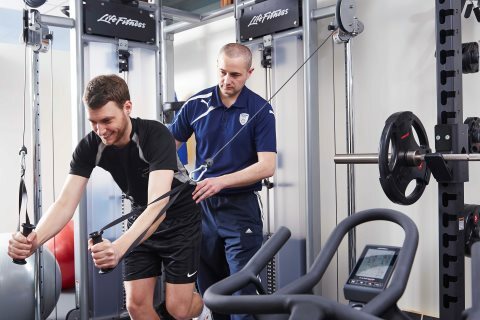 If you would like our Physio Team to help you, please do give us a call or send an email and we would be happy to discuss your individual situation. Please call us on 02380 475637, email enquiries@hantswellbeingcentre.com or complete an enquiry form below. Once again being put back together by the most incredible Sports Physio, Paul McIntyre. Without Paul, there is not a chance I'd be competing or playing sports at the level I do with my medical condition - EDS. Where ever I am around the world (including remote places), when injuries pop up and accidents happen he's on Skype talking me through what I need to do to finish my event or expedition and when home tirelessly works to fix me. Total legend. Thanks Paul. Our son has worked with physiotherapist Mel South since having major foot surgery in 2014. She has been a constant support to James through his physiotherapy programme and always offers both friendly and professional support to him. Mel finds a way to ensure James has fun during his sessions but still works him hard. She shows a huge amount of compassion and really cares about her clients. The knowledge Mel has in her field is exceptional and she is excellent at explaining and demonstrating what needs to be done. The team at Ageas are always professional, friendly, punctual and courteous. The clinic is always clean, tidy and welcoming and it is always easy to park.